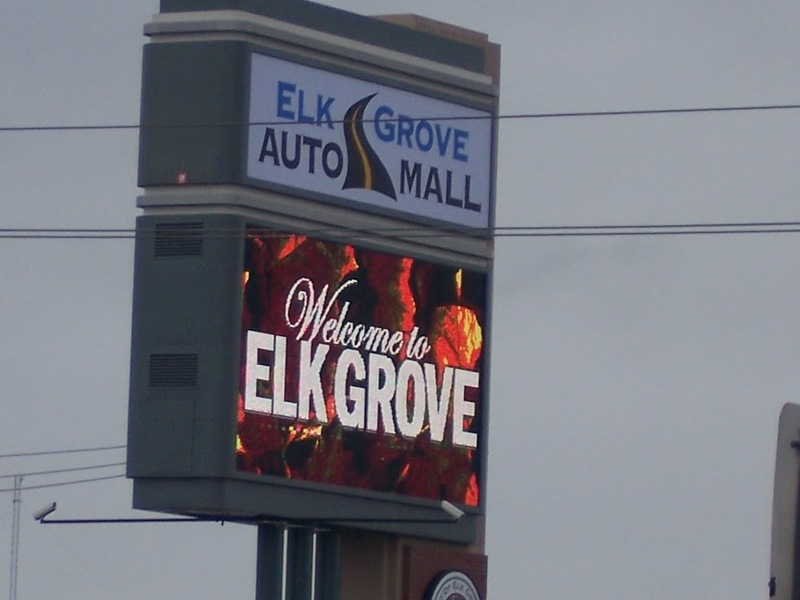 As a follow-up to the recent loosening of its billboard ordinance, the City of Elk Grove will now consider allowing electronic billboards within the city. The matter was brought up at the Wednesday night Elk Grove City Council meeting by Vice Mayor Pat Hume who asked that it be added to a future agenda. Pointing to the proximity of two electronic billboards installed just outside of Elk Grove City limits on Highway 99, Hume noted the revenue potential for the city and the possible needs of similar signs for the unfinished Outlet Collection at Elk Grove, formerly known as the Elk Grove Promenade. if the Elk Grove City Council approves their placement. "I know that more than likely that when properties like the mall come forward, they will probably be interested in having one potentially," Hume said. "So I think it would be prudent to establish a policy ahead of time." The two other council members in attendance at the meeting, Steve Ly and Darren Suen, agreed. Ly said that he too had that on his list of items he is pursuing. "I think you are reading my mind," Ly said. "I actually put in a request with our city manager for a possible workshop." Suen agreed with his colleagues adding that the city could use the digital billboards as an alternate communication devise to residents. "I've been looking for ways to reach the community," Suen said. "Not everybody is on Facebook, not everybody is looking at our website." In May, the Rancho Cordova City Council approved by a 3-1 vote the placement of electronic billboards in their community along U.S. Highway 50. The 60-foot tall billboards will have 672-square feet surfaces and the city will receive annual royalty payments of $56,000 for the next 25-years. Often characterized as visual blight, Region Business Executive Director Joshua Woods said they can provide the city with a new revenue source, but noted the importance of design. "Electronic billboards have the potential to draw significant dollars to fund essential city services in Elk Grove. The trick is to balance the potential income opportunities with the need for quality design and spacing," Woods said. "Done right, these signs can be a visual enhancement that drives revenue; done wrong, these signs could make Elk Grove look like a b-movie version of Las Vegas without the slots." The measure of a good city is not how much money they make. Just another project to add to the cities unfinished list. Will reading an electronic billboard eliminate our needs to leave the city for shopping and entertainment. Seems they've got the cart before the horse. An electronic billboard does not make a city! The city just had hearings this year about placing 60+' billboards along Hwy. 99 and now want digital billboards? What was not mentioned at our council meeting was that Rancho Cordova mitigated an agreement with Sierra Outdoor/Outfront Media to remove four traditional billboards in exchange for the right to put up the digital billboard. Councilman Sander said he dislikes blight from billboards. So, is this a new direction our city will be taking...removing billboards? Funny, people seem to be finding the Roseville Galleria, not to mention all the other stories in that area, without electronic reader boards; even people in Elk Grove whom these councilmen seem to think are mindless, unintelligent idiots that must be lead around by signs. It appears that Hume has decided, “If you can’t beat them, join them,” with another dim-witted idea from the dais. The wayfinding signs haven’t even been installed and now Pat Hume wants more. Guess who starting drinking the Kool Aid from Detrick’s cup? After all, “The Mentor” wasn’t at the council meeting, so he must have left his juice! Well....we just do not need quality in our city...it is all about quantity...you know more is better, not less is best. The council direction continues to diminish the vision of the earlier activists who had a better vision for our city. As one of her last emails said "We(residents) are screwed". Indeed she predicted the future. How unfortunate. I keep attempting to prove the wise woman and qualified, experienced planner wrong. Silly me! Or maybe really dumb me! For us oldsters that hang out at Tony Packo's, to paraphrase Del Shannon, "Hat's off to Pat!" Introduce your idea, then have Mr. Ly mindlessly parrot you saying he had the same idea. And for the frosting on the cake, have Mr. Suen present the features and benefits of placing some of these signs around town. Can you say serial meeting? The fact that Hume and Ly both had the same idea is more than a coincidence. Someone has been feeding our council with dollars and then demands for getting more dollars in return. The night Elk Grove Auto Mall reader board was approved by the Elk Grove City Council, albeit amongst much citizen opposition – including when Sarah Johnson was speaking, Tom and Sandi Russell were holding up a huge sheet at the back of council chambers – was the same night the Council was voting on the current year’s grant funding. The dealers also agreed to donate $50K to the city's grant funding every year. To my knowledge, that has not occurred. In approving the electronic reader board, the auto mall dealers also promised free advertising for all city events. Is that currently being done? And this is what the Council promised those of us opposed to electronic reader board – that it would be the only one in Elk Grove! Signs are intended to increase retail business which in turn results in higher sales tax revenue. The city should be run like a city and frankly our skyrocketing home values are the dividends we are receiving from this "business". Davis, Roseville, Granite Bay, Land Park, Fabulous 40s, and Folsom are the only other areas with higher property values than us. Between the flag wavers at every intersection; the new wayfinding signs in town; the new subdivision directory signs; the inflatable signs; the floating weather balloons over the auto plaza; and the infamous elk sign along the freeway-I welcome some electronic billboards along the freeway! The more signs, the greater the revenue and the greater our home values! See, it's all about running the city like a Fortune 500 corporation and passing the profits along to the shareholders. If the sales tax increase goes on the ballot, just think of that as issuing new shares of stock to help raise capital for reinvesting. Simple as that! While our focus is on wayfinding signs and digital billboards Electronics giant Toshiba has signed a lease for nearly 21,000 square feet in a Folsom office building, its first office in the region. The firm will employ up to 60 workers at 35 Iron Point Circle, in both sales and research and design capacities. Region Builders or whatever their new name is didn't clue you in on this one? Maybe time to hook up with some brokers. What a podunk hick city. This place is going to become a steaming dumpster fire like Palmdale.